Preorder now and save. Due to unusually high demand the ETA is May 10th. The garden shed layout provides easier access to the sides and edges of the shed. This layout is ideal for getting easy access to your gardening supplies and tools inside the shed. 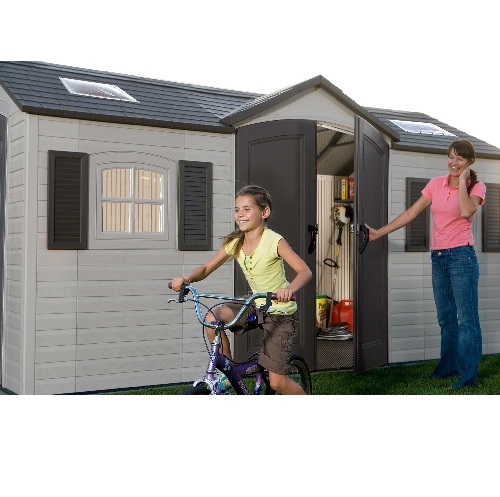 Add an additional entryway on the 8-foot side of the shed and you have greater ease of access and many more storage layout options. 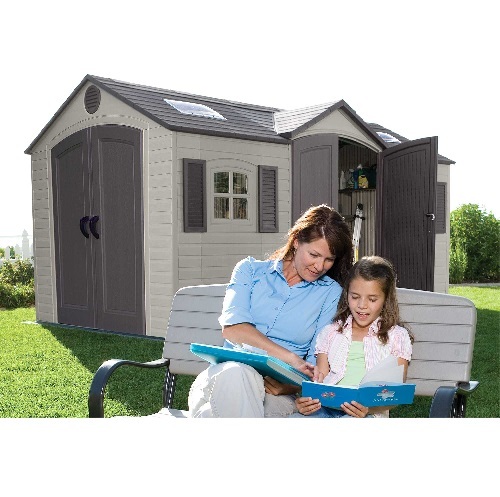 Like all Lifetime shed products, the 60079 garden shed comes with a 10-year warranty from Lifetime Products for the United States and Canada customers. This shed features high-density polyethylene (HPDE) plastic panels with powder-coated steel reinforcements. Panel material of construction: high-density polyethylene (HDPE) plastic. Low maintenance. No repainting necessary. Comes with 1 qty. 90 x 9'' shelf for inside storage. Comes with 4 qty. 9.5 inch radius corner shelves. Panel structure reinforced with powder coated steel. Comes with 2 windows that can open half way to improve inside ventilation. The floor is slip resistant with textured molding. 2 entry ways to help provide better access to different parts of the shed. Includes 2 Large Skylights and Skylights along the ridge. Exterior Roof Width: 180 in. Exterior Roof Depth: 96 in. Interior Height: Minimum: 70 in. Interior Height: Maximum: 94 in. 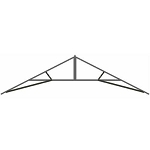 Interior Headroom (truss to floor): 80 in. Need to extend the shed to be even bigger? There are extensions available that expand the shed by 2.5 ft. Click here to view the shed extension that includes a window or click here to view the expansion kit with no window. They match the shed perfectly looking as if you purchased the shed at the larger size in the first place. The extensions can be added after the fact as well. This shed ships directly from Lifetime Products factory in Clearfield, Utah. Orders generally leave the warehouse within just a few business days. Delivery is via a curbside delivery. This type of delivery requires the customer to be present to sign for the delivery and to move the product wherever needed on the property. The driver does not assist in moving the product. Please plan for the delivery accordingly. The freight company will schedule a delivery appointment with the customer before delivering the shed. The shed was delivered right on time in four very large boxes. It arrived in perfect condition and was packed tighter than any IKEA product that you've ever put together. The packaging was efficient and contributed to the items safe delivery. If you've read any reviews on this product, you have likely seen that the directions are a bit nondescript. I will reiterate this sentiment and give a word of caution: study each step; the direction of every bolt and screw matters! Taking the time to accurately decipher the cartoon instructions will prevent you from having to take things apart, thus saving time in the long run. The shed took a friend and me two full days to assemble. Now that its finally erected, I could not be happier. I love the shed and cant wait to pack it full of the things that have been taking up space in my garage! The dual door is a really nice feature as well, but keep in mind that you lose some floor storage space in exchange. Its definitely worth the upgrade if you think you are interested, though. Have fun storing! My mother and I purchased this Building so she could have a work space for her projects without taking up space on the porch. I was reluctant to purchase another "Assembly Required" shed after struggling to put together an Arrow Metal Building. I swore that I would never assemble another building after that experience. Even though Lifetime recommends two or more people to assemble this building. I was clear to me that they designed it for one person to assemble if needed. It took me about two and a half days from start (opening the boxes) to finish (fully assembled). I assembled this building on my own with no help. I must say it was AMAZINGLY EASY! Only three minor problems to address but by no means will keep me from a future purchase. The issues I encountered were the instructions for door placement and the panels. If you choose to put the door on the end as pictured, you will need to mirror image the wall panels from the instructions. The other issue concerns the shutters. If you go by the screw hole markers on the walls. The shutters will end up being installed about 5 cm about the top of the window. Because I didn't want to drill new holes, I simply installed hook on flower boxes to the windows. Lastly, one of the metal rails that is installed on the broad side door was too long and I had to use a hack saw to cut off about 3 cm. Three very minor issues that were easily remedied. It was truly a pleasure assembling this building for my mother. She will get many years of projects out of it. My wife and I finished this shed in about 4 days in between thunderstorms. Two people should be able to put it up in two days. The support from Lifetime is great with you tube videos, live chat help, or phone help. I found the "live chat" and online videos worked best for me. Page 90 & 91 in the manual will show you how to adjust your doors with shims. The delivery for me went smooth moving it from the delivery truck to my pickup but here's a tip. It comes in 3 boxes weighing about 800 pounds. I had no help so I had to remove the parts from the boxes from the back of my truck. If you do this keep up with which box the parts came from. This will save you time later on. Pay close attention to the instructions and make sure you have the right part the manual calls for. It can get confusing. All in all, we really like our new shed. Nice, good looking and solid shed. Give yourself a good 4 hours to assemble all the trusses first and door locks, door panels etc before beginning to assemble the shed itself with help of a buddy. Charge your cordless drill and extra battery because there are quite a number of screws, and careful not to strip the plastic. Comes together pretty easy, just need to lay out all the parts packages and item names. Also make sure your sub floor is level and continuous because you'll feel dips below the actual shed floor. The shed is awesome, follow the directions closely. would definitely recommend. Went up without any trouble. Lost a piece, called customer service to get a replacement, but then found the piece I had dropped. Had a few neighbors help out and got it done in one day on a Saturday. Very very pleased with the looks. Plan on cleaning up the backyard and making things more organized with this. Q: What is the height of the shed at the side peak? Q: Is it available in a gray color? A: It is not available in gray I am sorry to say. Q: Can these units be equipped for electricity ? And do you need to have a cement base put down before it’s effected? A: We do not recommend running electricity to lifetime storage sheds for liability purposes. It does void the warranty. The manufacturer recommends placing the shed on a flat structure such as a wooden foundation made of treated 2x4's and OSB board that you can pick up from your local home improvement store. The instructions show just how to build it and what materials are needed. The other recommendation is a concrete slab. The concrete slab is more pricey to erect. It is very important to make sure it is flat and drains well. If it isn't flat you may run into issues with your doors closing properly. Feel free to contact us with any other questions. Q: Does it come in bigger sizes i’ M looking for 12x16 or18 ? A: You can extend the 15 foot side of its in increments of 2.5 feet, but you cannot extend the 8 foot side. Q: Are these less secure than a wooden shed? Can the lockable doors be reinforced as well as the walls? A: They have steel reinforcements so they are comparable. But, a wooden shed can generally be customized to accommodate multiple locks. The shed cannot-there is only one padlock loop. A: The walls are desert tan and the door and roof is brown. Q: My question has to do with door opening & height.? I have club car and it has top with lights above. Please share sizes of doors. I will also remeaure as well. Thinking 78 or 80 inches so 7' needed. A: Door Opening Dimensions: 56 in.. x 76 in. Q: Is it possible to install the doors with the gable above them (the long side doors) off center (closer to one end)? A: It is not possible to off-center the doors. You can put the door on the left side or the right side the front or the back, but it must be centered. Q: What is the strength of this shed in snow? I live in the northeast. Q: Is this available in 8x10 or 8x12? A: Yes, it is model 60001. Q: If we wanted to store a couch inside are the seams between sections and between walls and floor well sealed so water can't get in and so the things inside don't get moldy? A: Yes, you will not get water inside, but there are storms capable of getting water inside a structure depending on the wind speed in the amount of water. For example, several inches of standing water could get into any shed where the wall and the floor connect. Also, it has airflow vents to prevent condensation, but that also means that it is exposed to temperatures and humidity of the exterior to some degree. I hope that is helpful. Feel free to contact us with any other questions. Q: How much does it cost to have it assembled, and does that include fastening to the base? A: We don't do assembly. We simply sell the storage shed and ship it to you. Most customers choose to assemble it themselves. Sometimes customers will simply hire out the base for the concrete slab-whichever you choose. Q: My uncle has your 15’ x 8’ do you folks have any video to help assembling? Q: What are the tolerances for level? Is a very slight grade change permitted? A: Officially, the recommendation from the manufacturer is that it be on level/flat brown. Many customers do put it in the driveway that is sloping slightly and have no issues. A: We can price match in many instances. To determine whether we can price match in your situation please visit the product listing and underneath the price you will see a link called "Find Cheaper Price? Click Here" That will give you a short form to put in the competitor's price and link along with your email so we can send you our best price. A: GOOD EVENING; CAN furniture fit in this? How monthly payment? Q: How do you anchor to ground if you don't have cement? A: Yes, you can anchor it to a concrete slab. The anchors are sold separately, provided by the customer. On the interior there are locations on the floor near the wall where you anchor it to the ground. Q: Does this come in different colors and is the floor strong , as far as it housing a riding mower? A: No it does not come in different colors you can put a riding lawn mower in the shed as long as you put the shed on a strong foundation. Q: What is the color? 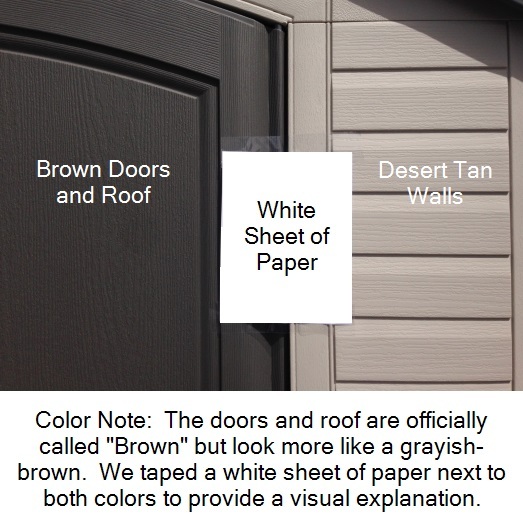 A: The doors and roof are officially called "Brown" but look like a grayish-brown. The walls are desert tan walls. Q: can I place the end door on either end? A: Yes you can place the door on either end during assembly. Was this answer helpful? 15 of 15 Customer(s) found this Answer helpful. Q: Does this shed come with the shutters? A: Yes, it absolutely comes with decorative shutters. Q: 0N THE 8’ BY 15’ SHED CAN THE CENTER DOORS BE PLACED ON THE OTHER END SO THAT THERE ARE TWO SETS OF DOUBLE DOORS WITH ONE SET ON EACH END? A: Unfortunately, no. One set of doors must be on the 8-foot side and one set on the 15-foot side. Q: Hi, I poured a cement pad that is 7 x 15 feet. I would like your input on how to make this shed work since it's not an 8x15 pad. Can I have one foot overhanging and onto my lawn? Should I put some gravel down there to make it 8'? A: I would suggest putting gravel down to make it level. Q: cost to ship to Hawaii zip code 96741? Q: I am looking for a shed to store my motorcycle and ATV and lawn mower in. Can the floor on this shed handle the weight? Motorcycle is about 900 pounds? and do you think a 15 x 8 is large enough? A: yes, it's important that you put this either on a concrete slab or on a wooden base per the instructions recommendations. Doing so allows you to even drive a full-size vehicle on it-the floor can handle it easily. Feel free to contact us with any other questions. Q: Are the individual door widths 28 inches? i.e. 2 door width 56"? A: Yes, that's correct. Both doors open together created the widest width of 56 inches. Q: You have the 15 by 8 model with two doors advertised at $400 off. What is the actual price of that item? 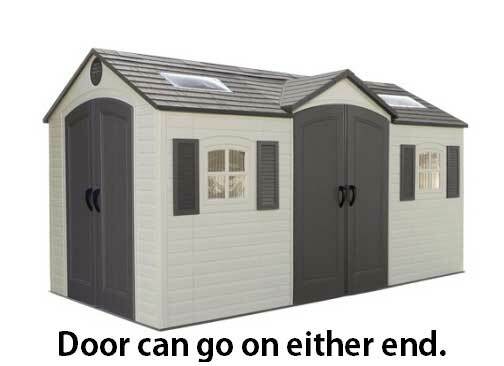 Q: Can the side door be placed on the right side of the shed as well as the left side? A: Yes, you can put the door on the left or the right side during assembly. Q: The concrete pad for the lifetime shed 60079 should be 178x93 1/2 according to the directions. Are there any disadvantages if it were larger, like 184x99 1/2? A: The advantage to having it at the exact size the manufacturer recommends is only for rain. The rain coming off the roof will drip off over the edge of the concrete. If your storage shed foundation is larger than that it will simply drip down onto the concrete. It won't hurt the shed any, but it is something to keep in mind. If it's a very large foundation and it is winter, obviously the water can freeze etc. Feel free to contact us with any other questions. A: No, the instructions show a foundation that will almost perfectly fit the shed. If you use a larger one, then it will simply extend beyond the edges of the shed. Q: Can the side door be put on the right side or will it only fit the left? A: The door can be placed on either side, just switch the panels on one side with those on the other when assembling. You will need to adjust the assembly accordingly. A: We do on some items and we don't on others. Please send us an email or contact us over the phone. Q: Can you ship to CANADA? A: We can, but not with free shipping. Just proceed to checkout and input your postal code and provide to get a shipping cost. Q: Can you place this shed on gravel? Q: Is there a shipping charge? A: This item has free shipping within the 48 states at the time this answer was posted. Feel free to contact us with any other questions. A: For installation you will want to call 855-544-8854, and give them the model number of the shed and your zip code. They will give you a price quote. Q: Can the Large Skylights be moved to the other side? A: Yes, these sheds are very adaptable, the skylights, windows, and even front doors can be moved. Q: How do I lock the doors? A: The Lifetime sheds have a small pair of braces on the doors where a padlock can be placed. Q: I want 10 by 20 how much it will be? A: We have 10 Sheds, and extension kits but we don't have any extension kits that work with the 10 Sheds, The largest 10 Shed that we have is 10 by 8. Your Best bet would be to get an 8 shed such as the 60079 and purchase 2 extension kits, such as the 6424 which would make the Shed 8 x 20. 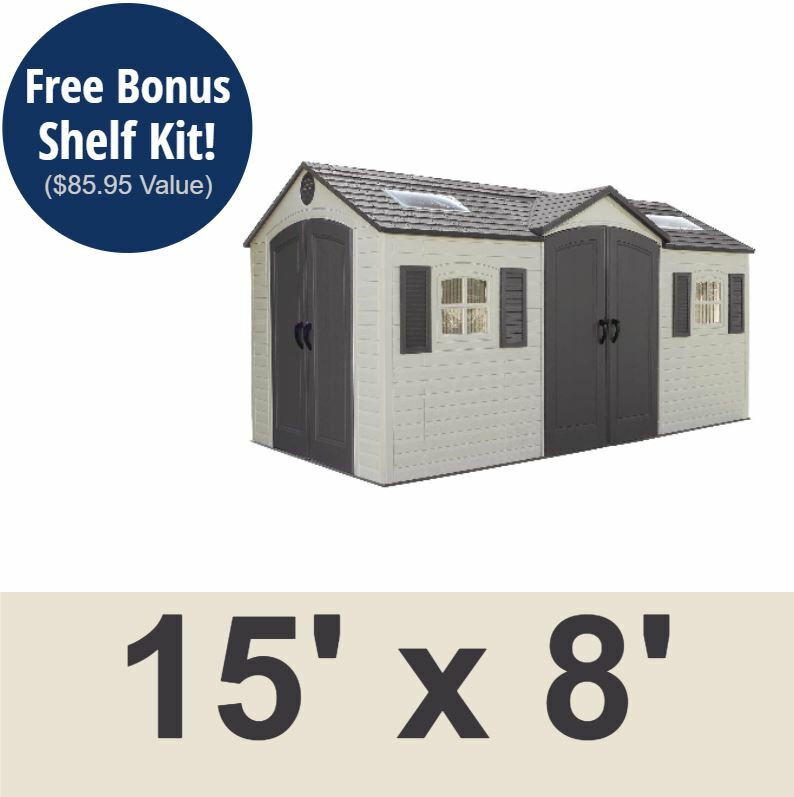 You could also do the same with an 11 shed such as the Customizable Shed and select the 11x 21 or the 11 by 18.5. If you call in today then we can give you a volume discount on these. Q: if I am not available to receive at time of delivery, but my wife is, will the delivery at least put the shipment onto my driveway, so that no street traffic will be obstructed? A: This shed is much too large for FedEx or UPS; it will be delivered by a Semi truck, and they will call in advance to schedule a delivery, they will deliver it on the curbside, so it will not block traffic. Q: What kind of free shelf? 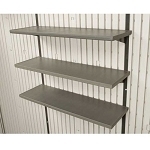 A: The promotion currently going on gives you a free shelf kit model 0130. It is a three pack of shelving. Feel free to contact us with any other questions. Q: Are the Side doors the same size as the front door? A: The Side and front doors are the same size. Q: How many square feet is this shed? Q: Do you ship to Ontario Canada? A: Yes, we sure do. Shipping can be a little bit discouraging, however. Please add the item to your cart and type in your postal code and it will tell you what the freight is to your location. Q: How tall is this shed? How much headroom? A: Interior Height: Minimum: 70 in. Q: I cant see the tracking for the shelves and want to know if they are just standard slot tracks you screw to the wall and move to needed height for items? Or how do they connect to wall? And how much weight will they hold? Multiple paint cans? lbs? A: It depends on the shelves you are referring to. The corner shelves just connect directly to the plastic in the wall. If they are the 30 inch shelves or the 90 inch shelves, they have their own channels which they come with, and you mount them into the wall, and then the brackets onto that. They do include the channels. Multiple paint cans would be stretching it. You'd want stand-alone shelves for multiple paint cans and heavy weight. A: We have now updated the listing to have the owners manual. It will show you the footprint size. If you simply click on the "instructions" tab below the pictures you will see a link to the owners manual wherein you can download it, print it, or use it as a reference. 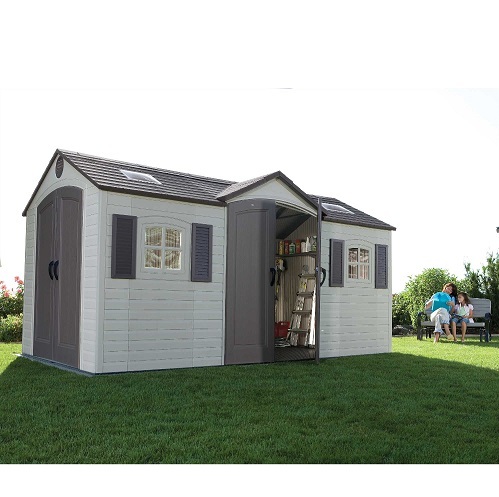 Q: Does Lifetime over a wind (tie down) kit for this shed? A: They do not. They do offer, however, the ability to anchor it to the ground (concrete). It incurs from the interior and you would use concrete anchors. I'm told that some hardware stores offer hurricane straps, but lifetime does not manufacture those. 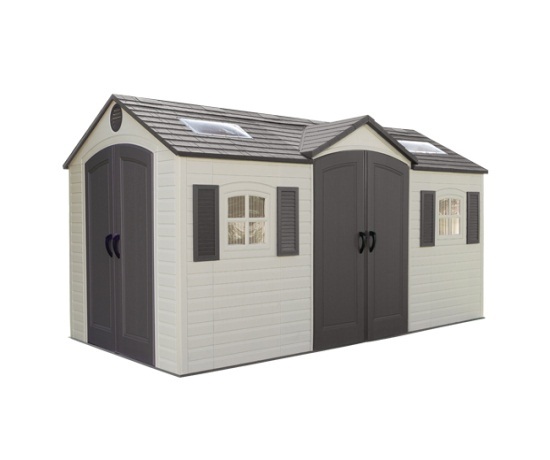 Shipping: Orders for the Lifetime 15 x 8 Dual Entry Shed generally leave the warehouse within 3 business days. Shed model 60079 comes in 3 Boxes. Box 1 is labeled 600791 and weighs 278 pounds, 96 x 32 x 15. Box 2 is labeled 600792 and weighs 220 pounds, 96 x 32 x 15. Box 3 is labeled 600793 and weighs 153 pounds, 86 x 32 x 9. This product has 30-day returns: Simply hang on to the original packaging and contact us within 30 days of receipt if you are not satisfied with this product. We are that confident you will love this product! If something is damaged or defective we will get it replaced at no cost. Our Lifetime items have an extremely low return rate. The reviews speak for themselves. Please contact us before purchasing if you are unsure whether this product is right for you by calling us toll free at 866-308-5484 or via email at websales@competitiveedgeproducts.com Please note that if anything is damaged or defective we replace it free of charge avoiding any return restocking fee. Dimensions: 96" x 32" x 47"